PA chairman lets slip in meeting with Norwegian FM that he violated a 2014 pledge to stop the practice. 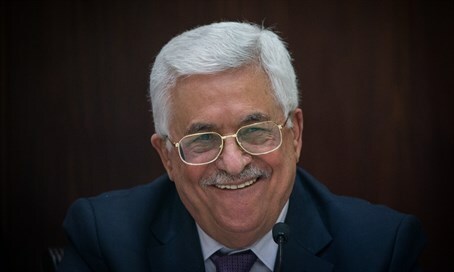 The Palestinian Authority (PA) still pays salaries to terrorists, PA Chairman Mahmoud Abbas admitted Wednesday, despite public assurances it had stopped the practice. The admission slipped out during a meeting between Abbas and Norwegian Foreign Minister Børge Brende, Palestinian Media Watch reports. Brende had promised during a debate in Norwegian parliament last week to put pressure on Abbas to stop using EU funds to pay the salaries. "'In the meeting, I emphasized that this support program in which financial payments are increased the [longer] the prisoners serve time [in prison], is unacceptable and should be abolished," Brende stated Wednesday to Norwegian publication Dagen. "I emphasized that with the political and economic challenges that Palestinians now face, it is in their own best interest to abolish this program." Abbas responded by "repeating assurances that Norwegian funds are not going to finance the program," he added - implying that the salary program is still up and operational. Last week, PMW exposed a billion-dollar scandal the PA has pulled since announcing in 2014 it would stop paying terror salaries. At the time, the PA claimed that it would not pay the jailed terrorists their salaries and instead the payment would be made by the Palestine Liberation Organization (PLO), the body behind the PA that had its terror status removed in the 1994 Oslo Accords when the PA was created. n 2015, following the PA's promise that it was no longer paying terror salaries and after it closed its Ministry of Prisoners' Affairs, it suddenly made a transfer more than double the amount it had moved over to the PLO in previous years, jumping from 294 million shekels (around $78 million) in 2014 to 775 million shekels (over $206 million) in 2015.